I’ve been wanting to pick up Carrie for a long, long time. Stephen King is a mastermind at story telling and I wanted to experience his first book that he got published. It definitely wasn’t what I was expecting, but I grew to like it. From the beginning Carrie never had a chance. From the bullies at school and her abusive mother at home, Carrie felt like she had no one to turn too. She was truly alone with her troubles with no one to guide her. I truly felt bad for her. No one deserves to be treated the way Carrie White was. One night it was taken too far. At her prom, where she finally felt like she belonged, she was humiliated and laughed at as students and teachers alike stood by and let a mean joke make her the laughing stock at prom. She had enough and she vented her anger through the only method she knew people would listen. Her power. It was a gruesome night, a night that the city would never recover from and it was all because no one showed Carrie White any compassion. The book jumps back and forth from different point of views including a reporter that was doing research on the Carrie’s telekinesis. It became a wildly researched phenomenon when people learned of Carrie’s abilities and the carnage she chose to do when she had enough of people treating her like garbage. She was a child who was outcasted for being different, and when she got upset she had the power to move things with her mind. I think the book would have been more entrancing had it been written in first person from start to finish. I didn’t like how the story jumped back and forth from past to present, talking about situations that hadn’t happened yet, leaving the reader grasping at straws to understand the conversations. I am so happy to be able to say that I have finally read a book written by Stephen King. His books have been on my shelves for years and I never picked one up until now. I think I was a little nervous because of how many stories he has written and all the hype that surrounds his name. He will always be a cultural phenomenon and I didn’t want to be disappointed. Carrie was good and I can’t wait to continue reading Stephen King books so I can see his writing progress from the Carrie. After all I imagine his writing might be very different now as this was his first published work and it was released quite a while ago. Stephen King was born in Portland, Maine in 1947, the second son of Donald and Nellie Ruth Pillsbury King. He made his first professional short story sale in 1967 to Startling Mystery Stories. In the fall of 1971, he began teaching high school English classes at Hampden Academy, the public high school in Hampden, Maine. Writing in the evenings and on the weekends, he continued to produce short stories and to work on novels. In the spring of 1973, Doubleday & Co., accepted the novel Carrie for publication, providing him the means to leave teaching and write full-time. He has since published over 50 books and has become one of the world’s most successful writers. King is the recipient of the 2003 National Book Foundation Medal for Distinguished Contribution to the American Letters and the 2014 National Medal of Arts. Lara Jean didn’t expect to really fall for Peter. She and Peter were just pretending. Except suddenly they weren’t. Now Lara Jean is more confused than ever. When another boy from her past returns to her life, Lara Jean’s feelings for him return too. Can a girl be in love with two boys at once? In this charming and heartfelt sequel to the New York Timesbestseller To All the Boys I’ve Loved Before, we see first love through the eyes of the unforgettable Lara Jean. Love is never easy, but maybe that’s part of what makes it so amazing. Lara Jean is so innocent and perfect. She bakes and does crafts and volunteers at the local retirement home. She is also in her first real relationship with the most popular boy in school Peter Kavinsky. Their relationship has had some ups and downs throughout the first book of this trilogy and those issues are still being worked out through the beginning of this second instalment. High school is a place for gossip and bullying and Lara Jean can’t escape the mean girl that is out to get her and her relationship, especially since Genevieve is Peter’s ex girlfriend. When a video of Lara Jean Peter making out in a hot tub goes viral they are both embarrassed and upset. The students laugh and judge and hide behind their computers as they continue to share and comment their thoughts of Lara Jean. I became so entranced by this book that I found myself staying up till morning so that I can finish the last few chapters and find out what happens. No matter how tired I got I refused to stop until the acknowledgment page. And I am so glad I did. I love the innocence of first love and heartbreak. I didn’t however like how a second boy whom wasn’t present in the first book became a main character as he tried to win over Lara Jean. I found that the relationship between them seemed unnecessary. I am so tired of love triangles it’s ridiculous. I wish the author would have focused more on Peter and Lara Jeans relationships and explored their flaws instead of bringing a new threat to them all together. I cannot wait to finish this series though. It’s so light and sweet and it makes my heart melt. Peter and Lara Jean are so different from each other yet they seem perfect together. I usually wait a bit before finishing a series so that I can wrap my head around my feelings of the book and it’s contents but I can’t with this one. I am going to start reading the third and final book in this trilogy right after I finish this review. I’m giving this book 4 stars for playing with my heart strings again and again. High school can be tough and so can relationships when you’re are so young and in the middle of figuring out where your life is going to lead. But I hope Peter and Lara Jean make it. Because they deserve happiness with one another. Jenny Han is the New York Times bestselling author of Shug, The Summer I Turned Pretty series, co-author of the Burn for Burn series, and most recently, the To All the Boys I’ve Loved Before trilogy. She is a former children’s bookseller and children’s librarian. She lives in Brooklyn, New York. Clary Fray just wishes that her life would go back to normal. But what’s normal when you’re a demon-slaying Shadowhunter, your mother is in a magically induced coma, and you can suddenly see Downworlders like werewolves, vampires, and faeries? If Clary left the world of the Shadowhunters behind, it would mean more time with her best friend, Simon, who’s becoming more than a friend. But the Shadowhunting world isn’t ready to let her go — especially her handsome, infuriating, newfound brother, Jace. And Clary’s only chance to help her mother is to track down rogue Shadowhunter Valentine, who is probably insane, certainly evil — and also her father. To complicate matters, someone in New York City is murdering Downworlder children. Is Valentine behind the killings — and if he is, what is he trying to do? When the second of the Mortal Instruments, the Soul-Sword, is stolen, the terrifying Inquisitor arrives to investigate and zooms right in on Jace. How can Clary stop Valentine if Jace is willing to betray everything he believes in to help their father? In this breathtaking sequel to City of Bones, Cassandra Clare lures her readers back into the dark grip of New York City’s Downworld, where love is never safe and power becomes the deadliest temptation. I am so happy that I decided to re-read The Mortal Instrument series for a third time. I missed my favourite band of characters. And for the third time I was blown away by the in depth story telling, the amazing characters, and simply for the fact that I could not put this book down. I needed to know what happened even though I already read it. That’s a really great quality to a book. No matter how many times I read it, I am still engaged the same as if it was my first time. I love reading certain sections and realizing information that I missed the first time around. I am constantly falling in love with this series more and more. Clary is by far my favourite heroine. She is brave, even though she is given so many reasons to be afraid. She is thrown into a crazy new world filled with magic and demons and yet she always stands tall and faces whatever is in her way. She is remarkable in so many ways. Jace made my heart ache during this book. All he wanted was to feel accepted by his family. But unfortunately he got lost and started to question the people that had been there for him since the beginning. It’s easy to doubt yourself and believe you are not lovable. Especially when you have an evil father that corrupts everything in his past. And their feelings for each other drove me crazy! I want them to be together so bad and yet it’s impossible and wrong with them finding out they are siblings in the first book of the series. They try so hard to keep a distance from each other and it tore their hearts apart. I couldn’t turn the pages fast enough. I wanted to relish every second of every scene but I needed to know more and more. I tried to take it slow so that I could savour the story but it was impossible, once I get obsessed with a story I can’t stop until it’s finished. Cassandra Clare is a phenomenal story teller and I think everyone should give her books a chance. They will not regret the adventure and feelings that these characters bring the the story. Each one so unique and plagued with their own issues, yet they all fit together perfectly like puzzle pieces creating one master universe. Cassandra Clare was born overseas and spent her early years traveling around the world with her family and several trunks of fantasy books. Cassandra worked for several years as an entertainment journalist for the Hollywood Reporter before turning her attention to fiction. She is the author of City of Bones, the first book in the Mortal Instruments trilogy and a New York Times bestseller. Cassandra lives with her fiance and their two cats in Massachusetts. Would you dare to defy destiny? Are our destinies written in stone? Do we become nothing more than the self-fulfilling prophesies of other people’s opinions? Or can we dare to become who we believe we were born to be? 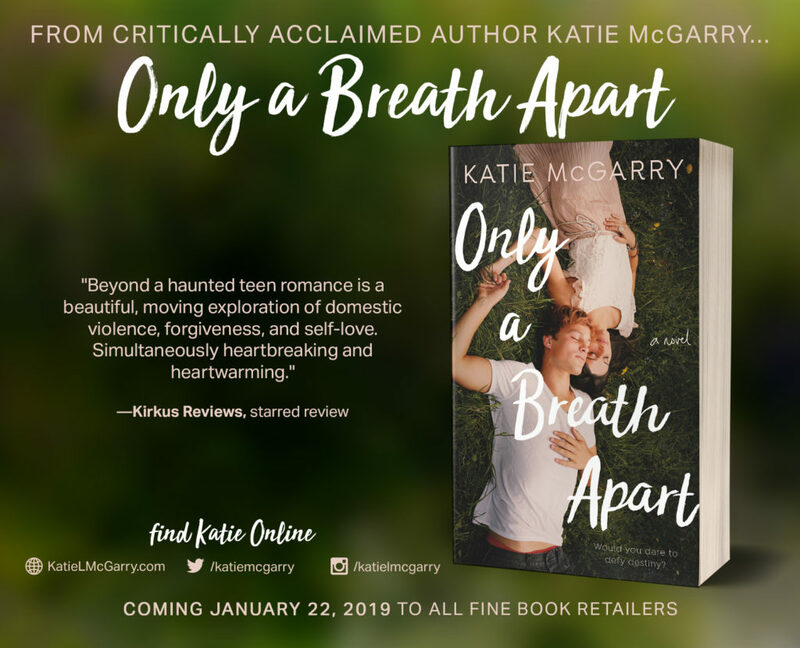 “A gorgeous, heartfelt journey of redemption and love” (Wendy Higgins), ONLY A BREATH APART is a young adult contemporary novel from critically acclaimed Katie McGarry. “Haunting, authentic, and ultimately hopeful” (Tammara Webber), order your copy of ONLY A BREATH APART now! They say your destiny is carved in stone. But some destinies are meant to be broken. The only curse Jesse Lachlin believes in is his grandmother’s will: in order to inherit his family farm he must win the approval of his childhood best friend, the girl he froze out his freshman year. A fortuneteller tells Scarlett she’s psychic, but what is real is Scarlett’s father’s controlling attitude and the dark secrets at home. She may be able to escape, but only if she can rely on the one boy who broke her heart. Add it to your Goodreads today! Hot isn’t exactly the word I would use for him. Hot somehow feels…lacking. Hot is for some boy in our gym class who has recently grown facial hair. Jess Lachlin is no boy. He has fire-red hair, a sun kissed tan from all the hours working on his land, deep green eyes and a body made to handle rough, rugged days. “Would you date him?” Evangeline asks. “Why wouldn’t you?” The kneejerk question surprises even me when it pops out of my mouth. Camila and Evangeline look at me as if those were the first words I’d ever spoken. If I could hide under the circulation desk without making this moment worse, I would. “Did you know that before Veronica started hanging with Jesse that she was on track to be a concert pianist?” Camila says. “Seriously?” Evangeline tilts her head in disbelief, and I’ll admit to putting down my cell. Faint middle school memories of hearing Leo’s name over the announcements regarding soccer emerge in my mind. Nazareth sleeps through most of our classes, that is, when he bothers showing for school. I nibble on my bottom lip as I’m not sure how much I like the Jesse-is-the-devil enthusiasm. I may share the opinion, but that doesn’t mean anyone else should. “The fights,” Evangeline pipes in. “And he’s been arrested!” Evangeline finishes Camila’s statement like the two share a brain. Her eyes sparkle like that precious piece of scandalous gossip was just too good not to spread. I think it is safe to say that Only A Breath Apart is not what I expected. This is the first stand-alone that I read from Katie McGarry and I freaking loved every second of it. From the very first chapter, my heart ached for Scarlett. I connected with her so much, and I grew obsessed with finding out how her story ends, which is how I managed to finish this book in one sitting. Katie McGarry has an art for making her characters down to earth even while they deal with the family traumas that encircle them. The characters in this book are no exception. This book is a little darker than Katie’s other novels as our main characters deal with domestic abuse. There are a few graphic scenes that make my stomach churn, as I hoped that the victim would in the end be okay. I’m not going to lie Jesse was hard for me to like in the beginning. I found his attitude to be quite demeaning, like he knew who others were, without taking the time to think about what others might be going through themselves. I couldn’t stay mad at him though because that boy has gone through a lot of heartbreak in his life, especially with his family being cursed to bring misfortune. After everything these two characters have been through it made my heart swell to see them reconnecting again after not being friends since they were little. There was so much history between them and I was shipping them so hard throughout the entire book. This book is no exception from all of Katie’s previous novels. It will leave you breathless, your mind turning, trying to grasp your feelings after being put on a roller coaster of emotions that doesn’t let up until the very end. This book just fuels my belief that Katie McGarry is a master storyteller, and she will forever be on my favourite authors list. Give this book a read if you are in the mood for a gripping contemporary dealing with long lost friendship, family curses, domestic abuse and even a psychic. This book truly has it all. Katie McGarry is an auto-read/buy for a reason! 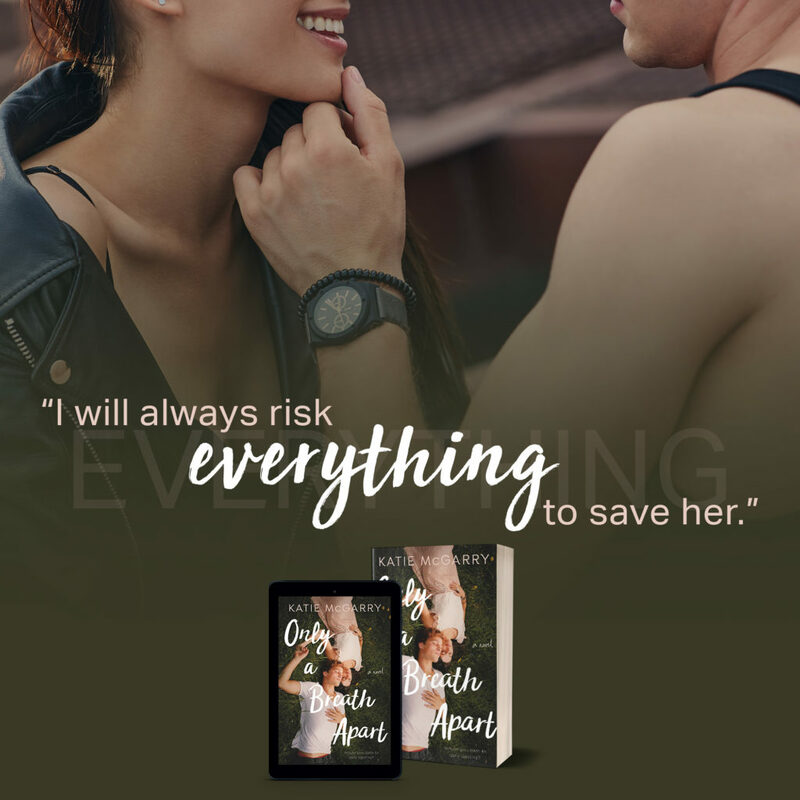 Katie is the author of the PUSHING THE LIMITS series, THUNDER ROAD series, SAY YOU’LL REMEMBER ME, and the upcoming YA novel, ONLY A BREATH APART. Her novels have received starred reviews, critical acclaim and have won multiple awards including being a multiple Goodreads Choice Award Finalist for YA Fiction, multiple RT Magazine’s Reviewer’s Choice Award Finalist for Best YA Fiction, including a win in the category, and she was a 2013 YALSA Top Ten Teen Pick. Something is out there, something terrifying that must not be seen. One glimpse of it, and a person is driven to deadly violence. No one knows what it is or where it came from. Five years after it began, a handful of scattered survivors remains, including Malorie and her two young children. Living in an abandoned house near the river, she has dreamed of fleeing to a place where they might be safe. Now that the boy and girl are four, it’s time to go, but the journey ahead will be terrifying: twenty miles downriver in a rowboat–blindfolded–with nothing to rely on but her wits and the children’s trained ears. One wrong choice and they will die. Something is following them all the while, but is it man, animal, or monster? Interweaving past and present, Bird Box is a snapshot of a world unraveled that will have you racing to the final page. Everyone is raving about Bird Box right now. Having just seen the movie adaptation on Netflix, I knew that I needed to read the book ASAP. Everyone said that the book was better than the movie and I wanted to find out for myself if I agreed with their claims. And after rating this book 5 stars, I realized that everything they’ve been saying about the book is true. I’m upset that it took the movie to discover this gem, because I would have bought it on the release date, had I known about it. Bird Box follows Malorie, a woman in her thirties, left alone with two children, trying to find a way to survive in the new world where no one can look outside without dying. The hardships that she had to face by herself, as well with by the group of survivors she holes up with throughout the book. The book is goes back and forth between the past and the present, over a course of 5 years where we learn everything that’s happened to her while the world comes to an end. This book was thrilling on every page. There was never a dull moment and I read the book in one sitting. It was impossible to put down, because I needed to know what happened to all the characters in this grim tale. The lengths that they were all willing to go to survive was remarkable. The friendships and the divides that were presented throughout the book were all matters of life and death. No one was safe, as much as I wished certain characters were still left standing. Thrillers like Bird Box are honestly what I am looking for in a book. Suspense, likeable characters, and ruthless plot problems that show the characters no mercy. I recommend Bird Box to anyone looking for a good horror/thriller vibe that takes place during the end of the world. I can’t wait to read more of Josh Malerman’s stories. If they are anything like this one, I know I am going to love it. Josh Malerman is an American author of novels and short stories. Before publishing his debut novel Bird Box with ECCO/HarperCollins, he wrote fourteen novels, never having shopped one of them. Being the singer/songwriter of the Detroit rock band The High Strung, Malerman toured the country for six years, as the band played an average of 250 shows a year, and Malerman wrote many of the rough drafts for these novels in the passenger seat between cities on tour. 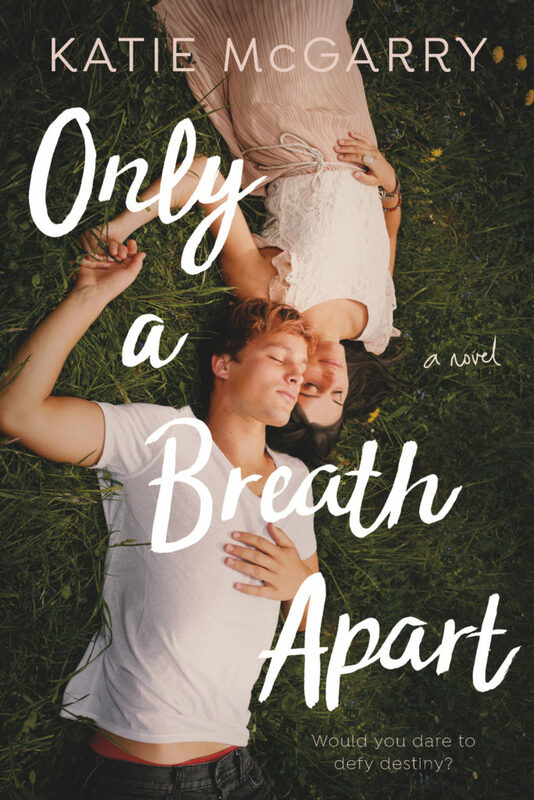 Only A Breath Apart Release Day! 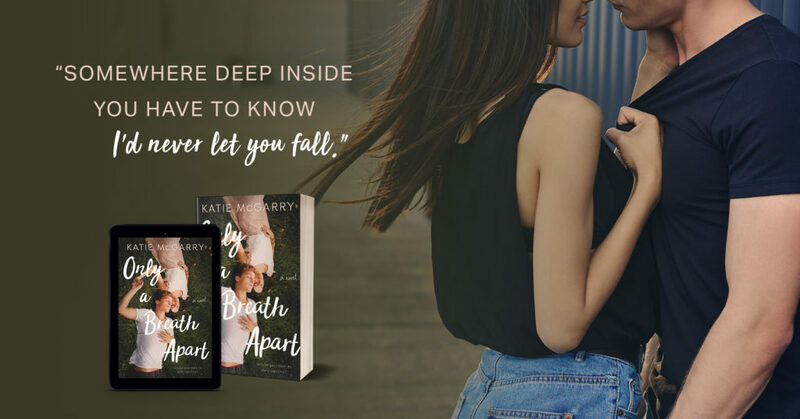 “A gorgeous, heartfelt journey of redemption and love” (Wendy Higgins), ONLY A BREATH APART is a young adult contemporary novel from critically acclaimed Katie McGarry. 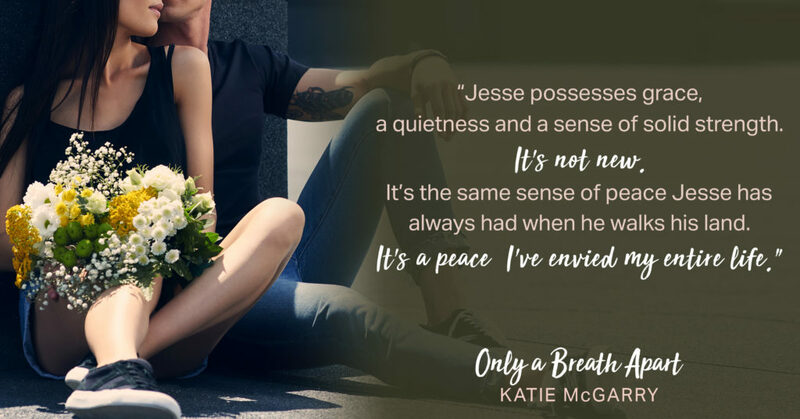 “Haunting, authentic, and ultimately hopeful” (Tammara Webber), ONLY A BREATH APART is now available! A scraping of a chair, a tray full of food and I glance over with my practiced smile in welcome. It’s not Camila, Evangeline, or anyone else from the group. It’s green eyes, red hair, a familiar mischievous smile that used to be reserved only for me, and my blood pounds with excitement as if someone lit a sparkler in my chest. Then I frown because I’m not supposed to feel this way. Not with him. Not with anyone. Jesse pops a fry into his mouth, chews, then picks up another as if he has no intention of answering. I scan the cafeteria. Several people are watching us, curious as to why Jesse Lachlin is sitting with me, or is event at lunch, or even at school. From the lunch line, Camila’s and Evangeline’s eyes are bugging out of their heads. What is going on? Camila mouths. He lifts his eyes to meet mine and there’s a glimmer in them that causes my lips to flatten. Fantastic. He’s here to make my life a living hell. “It seems obvious,” he says. He surveys the table, takes in the empty seats, my books, and then gives me a good look. A slow look. As if he’s trying to memorize every inch he’s drinking in. My cheeks redden because that somehow feels a little too intimate for lunch. Feels a little too intimate for someone I’m no longer friends with. It feels too intimate if we were friends. I glance away, but I sense him still staring at me. God help me, I want to stare back. This book has been getting crazy hype across social media. When I read the synopsis for Slayer I understood why. It’s a book about a Slayer after Buffy! And if you don’t know who Buffy is, you’ve been living under a rock and you need to watch Buffy the Vampire Slayer as soon as possible. I wanted to get my hands on this book as soon as I could. Slayer is about Nina and Artemis, but ultimately from Nina’s point of view. During her whole life, she’s been living in the shadow of her twin sister Artemis. Both raised by Watchers, the two girls are struggling to live up to the expectations that their council has set for them. And then everything changes when Nina discovers that she is the last Slayer. Ever. So now the twins and their group of friends are hunting for demons and trying to understand the changes that is happening with her. I loved this book. I got all the slayer feels that I was hoping for. I love how the author was able to incorporate the history of Buffy without changing to much of the original story. Don’t get me wrong this book is completely original story, having created a complete new set of characters, but Kiersten White was also able to insert her new characters into the original lore created for Buffy the Vampire Slayer. I was very impressed by how everything fit together perfectly. Every sentence in this book, had a meaning and a twist and everything fit together like a puzzle piece before the last page. Nina was my favourite. I loved her character and how much she needed to learn to become the best Slayer she could possibly be for her family and for everyone depending on her. Artemis did get on my nerves at time. She was just so overprotective that it felt like too much as times. I love how I wasn’t able to guess who was the villain in this story. I was shocked by the ending. No one is who they seem to be in this story. There were so many twists and surprises that I was left breathless. I needed to know what happened, and I couldn’t turn the pages fast enough. I’m giving this book 4 Stars for the amazing story-telling, and for the fact that the author was able to take a beloved story that everyone loves and add an original spin on it that makes it even better. This was my first book written by Kiersten White and I can’t wait to read her other works. Kiersten White is the New York Times bestselling author of the And I Darken trilogy, the Paranormalcy trilogy, Beanstalker and Other Hilarious Scarytales, The Dark Descent of Elizabeth Frankenstein, Slayer, and many other novels. Kiersten lives with her family in sunny San Diego, California, where she perpetually lurks in the shadows. 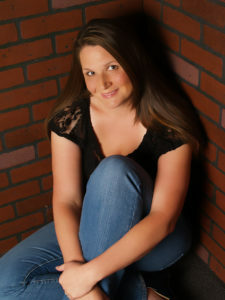 Visit her at http://www.kierstenwhite.com.